The Brafferton Group is a strong advocate of Action Learning which we believe is a tried and tested method of working effectively with individual and organisational challenges. It is well suited to the current economic climate where business leaders require focussed attention to specific areas of change and transition when budgets for development can be under pressure. Action Learning is built on solid theory with pragmatic, concrete techniques and practices. Although Action Learning contains some essential principles and elements it is flexible and adaptable to work well in a wide variety of settings and situations. 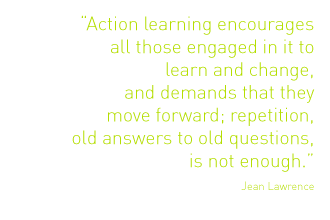 Learning is what makes Action Learning strategic rather than tactical. Our expertise includes the design, introduction and development of action learning based programmes across organisations. We provide Set facilitation and the training and development and support of facilitators within organisations. Central Manchester Hospitals NHS Foundation Trust to support their service improvement programme. Merseyside and Cheshire Cancer Network. GPs and Practice Managers and Specialist Registrars. Senior mangers in Eircom (in association with Trinity College Dublin) – board level projects were used as a vehicle for leadership and team development in their move from a public to a private organisation. National Management Development Initiative (NMDI) hosted by Lincoln University for Trent SHA. The Department of Health and two Strategic Health Authorities – as part of national initiatives to develop the leadership potential of middle/senior managers, focussing on specific business projects. We devised, developed and delivered a programme for the Provider Services of Sefton PCT’s Adult, Childrens and Therapy Services which had Action Learning at its core. Service leads worked in cross service sets, focussing on Change and Service Development projects identified and sponsored by the organisation.